I know that I am lucky to live in New England. 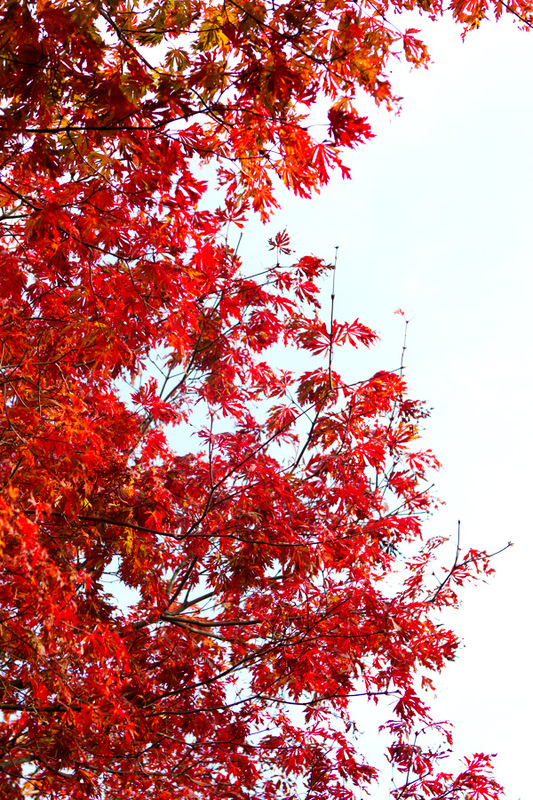 I am lucky because we have gorgeous distinct seasons, and most particularly, we have pretty colors during the fall. “Regarde maman, cet arbre est tout rouge ! ” (Look maman, this tree is all red!) Lulu exclaimed one day as she and I were driving back from school. It was impossible not to notice. She noticed. I noticed. We were feeling excited and warm inside from just looking at the display of the cheerful colors lining up the road. It looked so happy! Secretly, I wanted for this everyday scene to last for weeks. Until Thanksgiving at least, I thought. We are actually not far from it happening for real. Beside our unexpected snow storm, the weather in Boston has been mild and beautiful. The farmer’s markets have offered amazingly pretty and tasty fall produce: from winter squashes, radishes, apples, fresh ginger, cranberries, sprouts to colorful root vegetables. I’ve not grown up with the Thanksgiving tradition but I’ve learned to love it. For years, we’ve been invited to friends’ houses who cooked amazing meals. It’s during one of these dinners that I most likely ate my first pecan pie ever, wondering why I had never eaten one before. This year, however, I am hosting the holiday with P.’s parents in the comfort of our own home. And I am really excited about what we will be cooking together. Sharing and blending different food cultures. I’ve been thinking about it a lot. A month ago, an editor from Cooking Channel asked that, amongst a group of food writers, I shared my Thanksgiving ideas with a photo collage and a story. I liked the thought. So I said yes. My Thanksgiving menu is not set in stone yet–still thinking and rethinking, something I’m rather skilled at–but I already know that there will be turkey. Perhaps traditional. And I will prepare a kabocha squash and apple soup, using a favorite recipe of mine that I’ve made over and over during the years. This year, our soup will have aromas of ginger, lemongrass, mace and coriander, and I will round the taste with a dash of cream, freshly sliced apples and toasted hazelnuts. We tested it. We loved it. I will bake a potato, celeriac, apple and butternut squash gratin. Because a root vegetable gratin celebrates the fall like no other dish does. 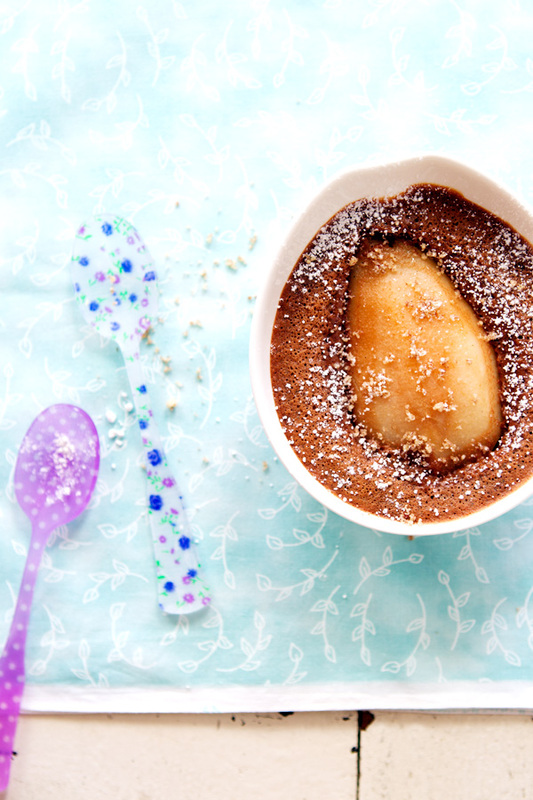 We will eat chocolate, with individual ramekins filled with cardamom-flavored pear and chocolate clafoutis. And we’ll eat salad. 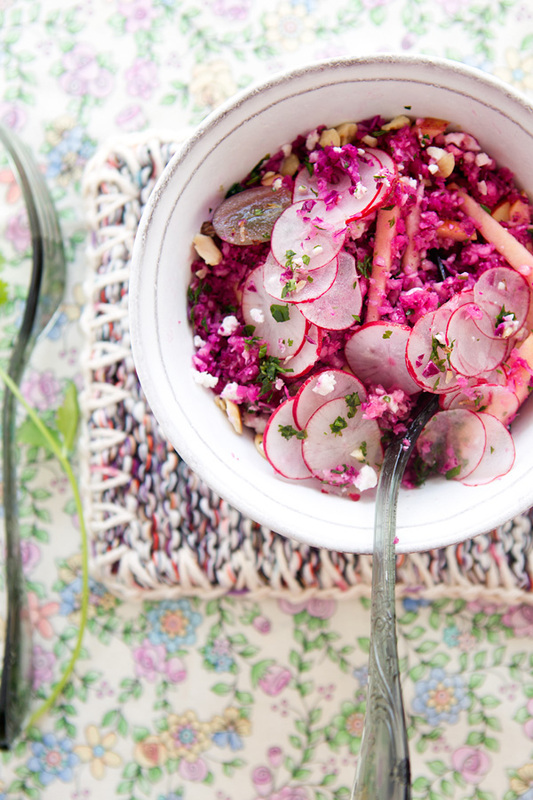 A fun colorful salad full of crunch. The first time I made it, I loved it even before trying it. The thought for this salad came last week after I visited one of my local farmer’s markets where I found delicious-looking young heads of celeriac. I knew they had to go in a salad. What about if I added red cabbage, radishes and apples? I thought while adding a few pieces of each to my basket. “Really? Enough to include it to our Thanksgiving dinner?” I asked. I looked at him and realized it was. And at the same time it wasn’t since the French often eat raw celeriac in a salad. But what I understood was that my unusual tabbouleh would be a wonderful addition to our menu to celebrate gorgeous local fall produce, the Thanksgiving holiday, and my French roots. Next week, we will feel American. French. Irish. Together. Happy Thanksgiving everyone! What will you be cooking, I wonder? Does anyone know the name of this beautiful purple berry I found at the Botanical garden a few weeks ago? In a small bowl, combine the sea salt, pepper and mustard. Add the white wine vinegar and then the two oils. Whisk to emulsify. Stir in the herbs; set aside. 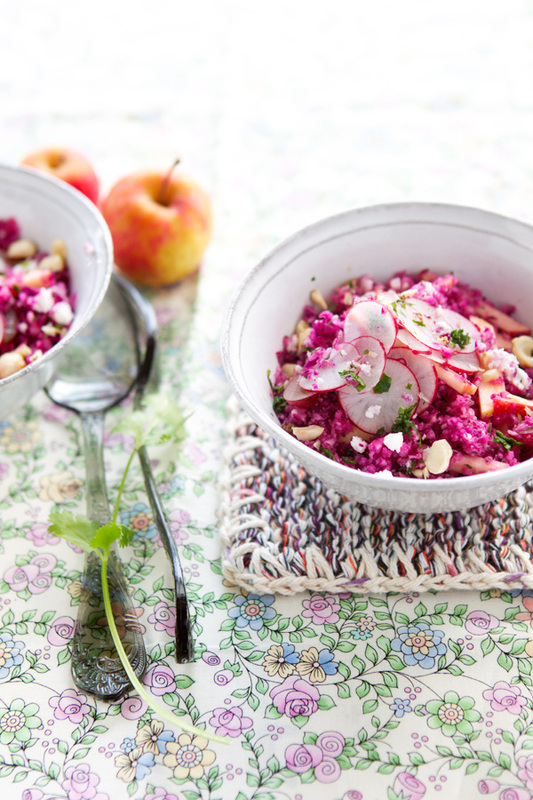 In the bowl of a food processor, combine the celeriac and red cabbage. Use the pulse option to chop the vegetables finely. Transfer to a bowl and drizzle with the lemon juice. Add the apple sticks, feta, grapes and radishes. Add the dressing and toss gently. Top with the toasted hazelnuts and serve. Dans un petit bol, mélangez le sel, le poivre et la moutarde. Ajoutez le vinaigre de vin blanc et les huiles. Fouettez pour émulsionner la vinaigrette. Ajoutez les herbes et mettez de côté. Dans le bol de votre mixeur, mélangez le céléri rave et le chou rouge. Utilisez la fonction o Pulser pour hacher les légumes finement. Transférez dans une jatte et arrosez avec le jus de citron. Ajoutez les båatonnets de pommes, la feta, les raisins et les radish. Ajoutez la vinaigrette et mélangez. Servez avec les noisettes grillées. i just love all the different colours! I love the brilliant colors in these dishes. Great post! Oh the pinks and purples are so pretty! 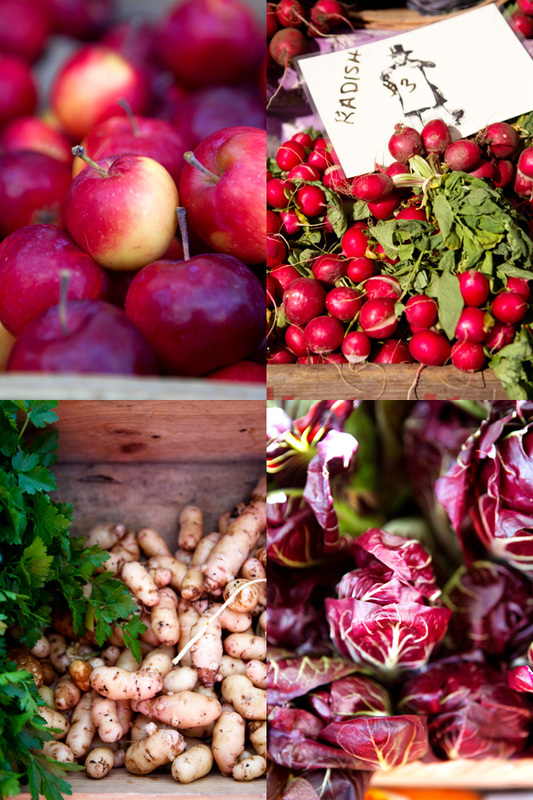 The photos of cranberries, apples, radishes, and radicchio inspire me to see autumn in a new way. Love the pear clafoutis too. I’ve been thinking lately that a mish mash Thanksgiving menu inspired by different cuisines is the best kind. The purple berries are on a ‘beauty berry’, Callicarpa something or other. 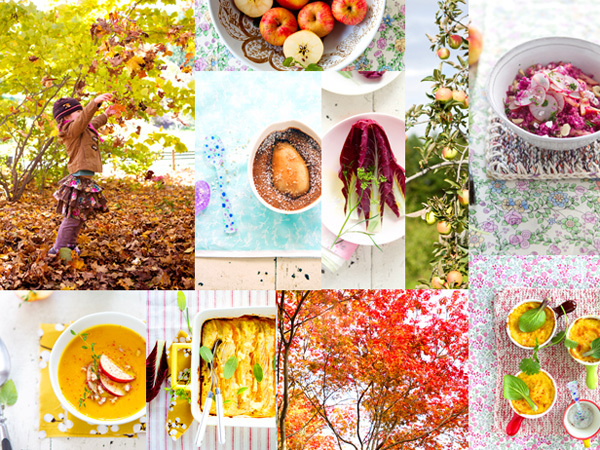 Beautiful images; so vibrant and full of life and a celebration of fall! What a beautiful post! I’m an American expat in Australia … so I understand the integration of traditions. Australia doesn’t have Thanksgiving (and it’s *so* hot here in November) so I do my own traditional meal in the autumn down-under – April. And it’s definitely an integration of my former lives, so to speak. Oh, I have to do a gratin tonight! it looks so delicious! Thanks for your inspiration once again. Je fais à peu près la même chose mais avec une betterave rouge que je mixe en taboulé. C’est excellent avec des noix de cajou. En voyant la photo j’ai pensé que c’était aussi de la betterave, mais le problème de cette dernière, c’est qu’elle déteint sur les autres légumes. Tout prend alors une couleur rose très girly…Je sais qu’on peut faire aussi du taboulé de choux fleurs (avec des raisins secs ou pourquoi pas des cranberries). Ici en Bretagne, et sans doute ailleurs, on trouve maintenant des choux-fleurs de toutes les couleurs : blancs, verts, violets. Voilà que cela me donne une idée….Et voilà où m’aura amenée ce joli post…. Your photos always make me want to go for a very long walk with my camera. Thank you for that. you have the most amazing, beautiful photos ever! EVER! this blog is inspiring for even someone who doesnt like to eat! love it- love it- love it! The soup sounds delightful! Sounds like you will have a lovely Thanksgiving. Blessings to you and your family. By the way–where did you find those adorable flowery spoons?? I’m loving all your props, as usual!!! On a different not–I finally found a moment to order your book and I’m counting the days until it arrives!! Beautiful. I was waiting to finish my Thanksgiving post before reading yours. Now that it’s posted, I jumped on it right away! Your collage is like a “quilt”-patches of gorgeous photos, all sewed together. Miam miam! I’m planning my own French American Thanksgiving fête à Paris, but it will certainly be less beautiful and delicious than yours! J’ADORE your site! 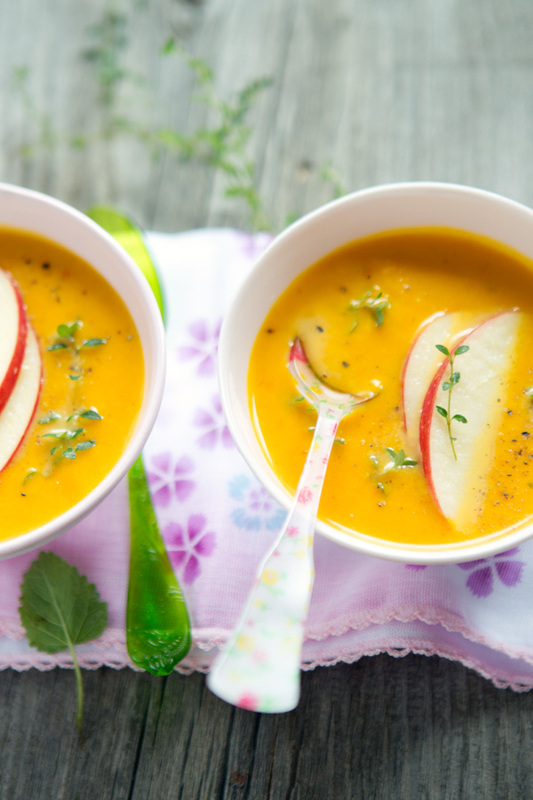 I just launched a new healthy cooking video website — I’m the reverse of you, une Américaine à Paris — and would LOVE to incorporate your recipes (and link to your blog, bien sûr 🙂 Where can I find the apple kombucha soup recipe for example? If you have any other gluten and dairy-free recipes you think might be great for Fall that I can use and cite you, would be formidable, merci! Looking forward to reading more about your Franco-American aventures en cuisine and Happy Thanksgiving! Beautiful! I have found colorful foods seem to taste that much better. Beautiful blog as well! Oh, your Thanksgiving sounds like it will be delicious! I’ve seen those little purple berries around my home here in the NW, I have no idea what they are either, but they are such a great color! Always such lovely photos. I think the purple berries are American beautyberry, a fitting name. Birds love them, I have one in my yard. (It’s also called sometimes called French mulberry) http://www.wildflower.org/plants/result.php?id_plant=CAAM2 Happy Thanksgiving! 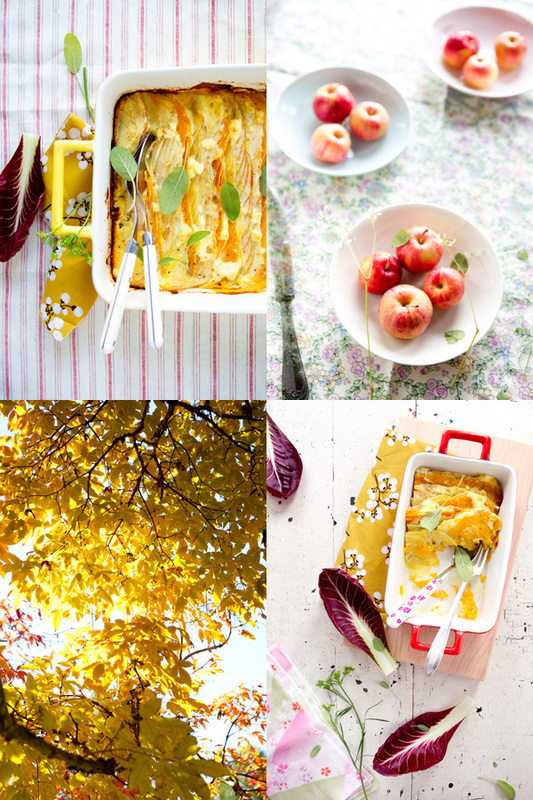 What a beautiful post…full of great ideas, nostalgia, love and inspiration… Thank you, and Happy Thanksgiving! Wanted to comment on your cookbook Bea. It is spectacular. I’ve made 2 chocolate cakes, risotto and a tart. They were all delish! Two mentions, we love BI, too. We have a house there and feel you captured it beautifully. Second, where can I find quinoa flakes? I don’t see them at WFs. Thank you for such inspiration. Kat. 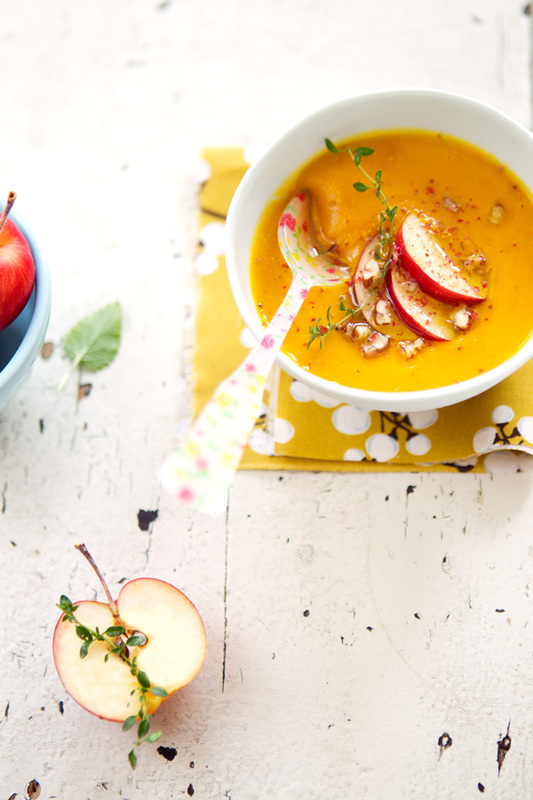 Un repas de thanksgiving qui promet d’être haut en couleurs et saveurs ! Et vive le mélange des cultures ! The purple berry is called [murasaki-shikibu] in japanese which is same name of the first female author who written [Genji-monogatari]. J’ai découvert votre blog, il y a peu de temps et je me régale de vos images. J’aime beaucoup les couleurs. Où trouvez-vous tous ces beaux tissus? Nous sommes dans le Rhode Island et je suis contente d’avoir trouvé vos recettes avec des produits que l’on trouve dans le New England. Bonne continuation. I’d love to try the pear and chocolate clafoutis. Your beautiful photos make me feel all yearny! I made your celeriac red cabbage salad, and it was absolutely delicious. The first night it was all pink, and leftovers the second night were purple, surprising colors, yet it was so refreshing and crunchy, we loved it. It was the first time I had ever tried to use celeriac. Thank you for your inspiration through stories, photos, and recipes. 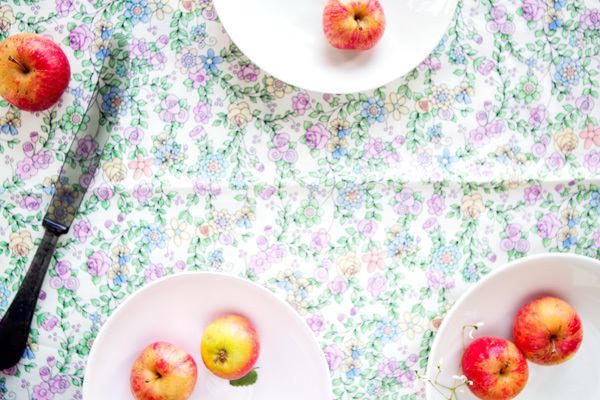 Great post – I HAVE to know where you gt that gorgeous cutlery with the flowery pattern?? I’ve never seen cutlery patterned like that on more than the handle! Thank your for again a beautiful post. The berries are probably Callicarpa bodinieri var. garaldii. You see these shrubs in many gardens in continental Europe, as the birds do not like the berries and you keep the lovely berries well into winter. Beautiful post, darling! 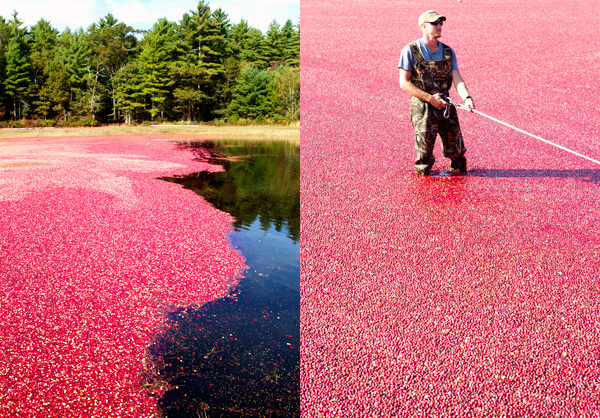 I have to say, the cranberry harvest is my favorite picture. 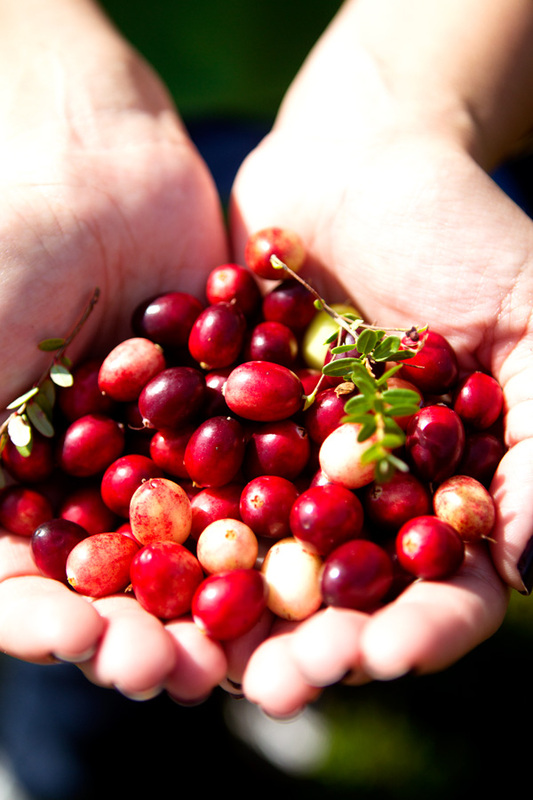 We pass by a bog on the Cape when we’re down there and I always love gazing at the massive amounts of cranberries. Thank you so much everyone, and for those who told me the name of these berries. I feel better now that I know. Wendy, so pleased you enjoyed the salad. Makes me happy to read! Mounia, I will post the soup recipe soon. Thank you for your patience. The spoons are from the French company Sabre. Pretty salad! and it just so happens I have almost everything already (bits and pieces from recipe testing can be challenging to use up!). I will be eating this on Thursday with my family and thinking of you and yours. A little crunch is necessary with all the rest of the dinner! I don’t know what they are called, but I used to see those purple berries when I lived in Quimper, France! Such a warm and lovely post. What a lovely post! As we get ready for our thanksgiving meal made from produce at our farmer’s market—they did a special Tuesday market for TG and the weather has been in the 70s—we’re thinking of you and wishing we were cooking together! Happy Thanksgiving! Your blog is beautiful, thank you for sharing your wonderful photos, they always brighten my day. 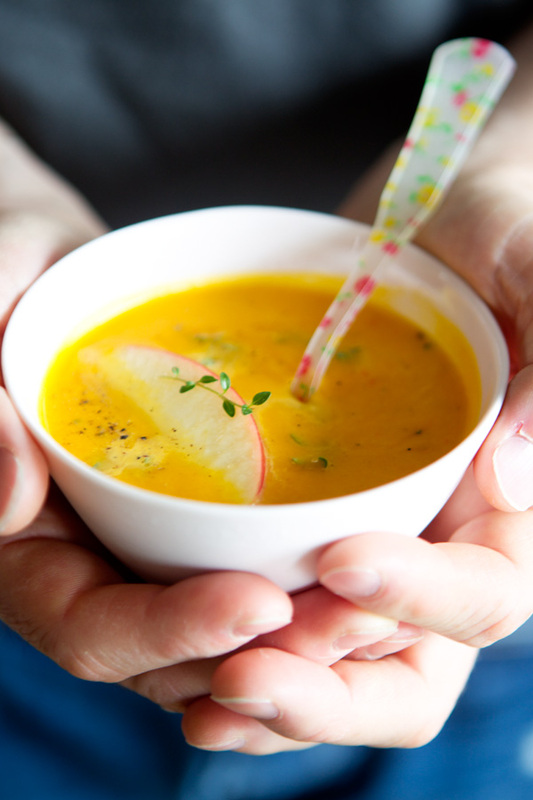 I would love to make the squash soup for Christmas, could you please post your recipe ? It would be much appreciated. 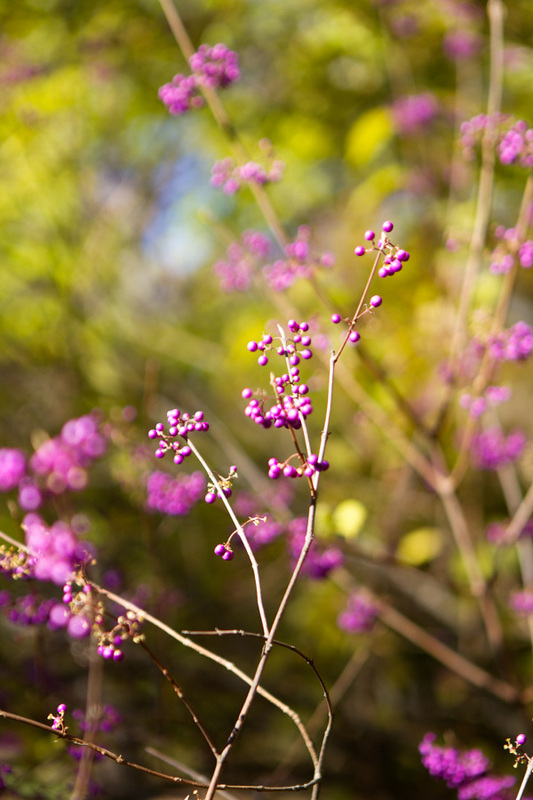 I became curious because I also thought your purple berried plant was a Japanese shrub called Murasaki Shikibu. I found this short blog entry with photos. I love your gratin idea but I’m not seeing your recipe. Would you be willing to share it? Thanks so much! Also, I believe that is a beauty berry bush. They are stunning!